That’s the title of a post by hamzacom on the Faloja forum. In it, he draws an analogy with Afghanistan just after the U.S. invasion. It was a time of defeat for the mujahids but now they are resurging. The same will happen in Iraq. Mukashshir Anyabahu (“Bares His Teeth”) replies that the people of Anbar, not just the Awakening members, deeply betrayed the mujahids. You have no idea of the extent of the betrayal and apostasy which transpired in Iraq, especially in Anbar….The people of Iraq completely betrayed the mujahids and allied with everyone who had turned away from religion, except those whom my Lord had mercy on….The situation of the mujahids has become extremely difficult. I am not saying that the jihad in Iraq has ended; it still continues by the grace of God. Anbar was lost because of the betrayal of its people. I will not say that it was due to the power of the Awakening and the apostates. By God, I believe that this entity called “The Awakening” is very weak. The problem is not the Awakening; rather, it is the betrayal in Anbar–those people who betrayed God and our master Muhammad by allying with the crusaders and the Jews. More evidence that the failure of the Islamic State of Iraq is severely demoralizing Jihadis, at least in the Arabic-speaking world. The answer is that God is testing the resolve of the mujahids in Iraq, the same answer Yaman Mukhaddab gave in July to dispel the pessimism of the Hesbah forum members. Spreading lies about the Islamic State of Iraq to turn the public against it. It wrongfully accuses the ISI of targeting civilians and sectarian killings. So great is the contempt that your enemy has for you that he announces his plan and guides you to the hole he has dug for you. Then you walk to the hole and throw yourselves in voluntarily!! Abu Osama1 on Firdaws is similarly clear eyed in his assessment of the ISI’s predicament, but he is more optimistic. He acknowledges that the number of explosions has decreased and the number of civilian deaths has gone down, but he argues that al-Qaeda is just playing dead and biding its time. None of the authors can bring themselves to say that the condition of the Islamic State in Iraq is terminal, but that’s the barely-concealed prognosis. How long have forum members been pessimistic over Iraq? Is the pessimism widespread or just a few members in one forum? Is pessimism over Iraq matched by increased optimism over Afghanistan or are these independent? It depends which forum you read. On Hesbah, there is a more frank discussion of the fortunes of al-Qaeda in Iraq (at least judging from the posts that leak out). This is probably because Hesbah is a closed forum full of old Jihadi hands, so members don’t have to be so guarded. The opposite is true on Ekhlaas, where newbies take turns one-upping each other with paeans to al-Qaeda. No one wants to be a downer. But since the end of 2007, I’ve noticed a steady increase in posts on Ekhlaas that say, “Just wait, a major victory is right around the corner!” You wouldn’t write that unless you were worried that things weren’t going so well at the moment. Everyone is in a state of anticipation these days. There have been consecutive announcements of the martyrdoms of first and second tier al-Qaeda leaders. People in Europe fear martyrdom operations there. There have been a series of attacks on the Islamic State of Iraq and attempts to break its power. There have been victories for the mujahids in Somalia and Yemen. Will the coming days be marked by more of our leaders dying, such that the U.S. will proclaim victory over terrorism? Or will these victories be followed by major setbacks that will put the lie to their proclamations? It looks like the coming days will be difficult for everyone. 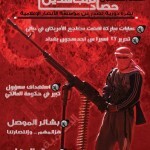 The morale of the forum fighters is the lowest I’ve seen it, at least among Jihadis who live in the Middle East. Afghanistan is a bright spot, but it doesn’t seem to offset the despair of Arab Jihadis, who can’t understand why al-Qaeda hasn’t gained traction in the Middle East. The bleaker things look for the Islamic State in Iraq–the embryo of the new caliphal order–and the longer al-Qaeda goes without a major attack in Israel, the U.S., or its closely-allied countries, the more anticipation builds that al-Qaeda will do something spectacular. When it fails to deliver, morale wanes. The al-Qaeda narrative that has developed since 9/11 is that it tricked the U.S. into invading the Middle East, where it got bogged down and bled dry. Once the U.S. leaves and the Islamic State in Iraq is secure, al-Qaeda will move into Syria and Lebanon, and from there stage attacks on Israel. But the failure of AQ in Iraq, the inability of AQ to strike in Europe and the U.S., and its lack of traction in the Middle East are interfering with the narrative and a new one has not emerged, at least not one that excites Arab Jihadis. Like Murabit Muwahhid hints, it will take a major attack to reaffirm the narrative. But circumstances at the moment allow the U.S. to create a counter narrative: al-Qaeda started in Afghanistan and it will end in Afghanistan. With the death of the top leadership that ordered the attacks on America, the cycle will be complete. 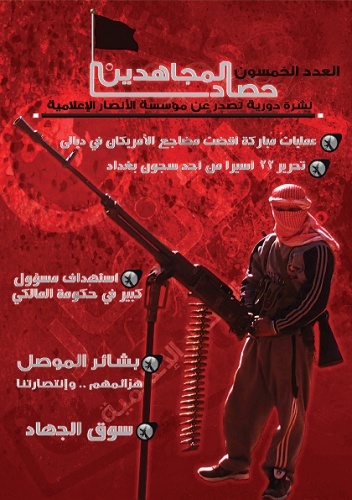 Yaman Mukhaddab, a popular contributor to al-Hesbah (the most exclusive Jihadi forum), wrote an essay on July 21 in which he expressed alarm at the low morale and pessimism of some of his fellow forum members on account of al-Qaeda setbacks in Iraq. One brother, he notes, said that the jihad in Iraq is ending like the jihad in Algeria (badly). Another brother criticized Mukhaddab for being optimistic about Iraq. A third said the situation is out of control and the outcome is already known. Mukhaddab responds that such pessimism is unwarranted. As scripture says, victory will come after severe testing. And things can turn around at any time. If AQ is able to strike the U.S. or if the U.S. strikes Iran, the mujahids in Iraq will benefit greatly (he doesn’t explain why). Mukhaddab ends by reminding his readers that there was a similar level of despondency after the U.S. invaded Afghanistan but things turned out well in the end. Despite his optimism, the fact that Mukhaddab would admit that other Jihadis on al-Hesbah–where the most influential pundits hold court–are souring on Iraq means that al-Qaeda is truly almost done there and that foreign fighters will be looking for greener pastures. That’s the claim of Abu Islam al-`Iraqi, one of the leaders of the “popular committees” in Diyala Province. 25 seems high, but it dovetails with what I wrote about the Harbi group last week. 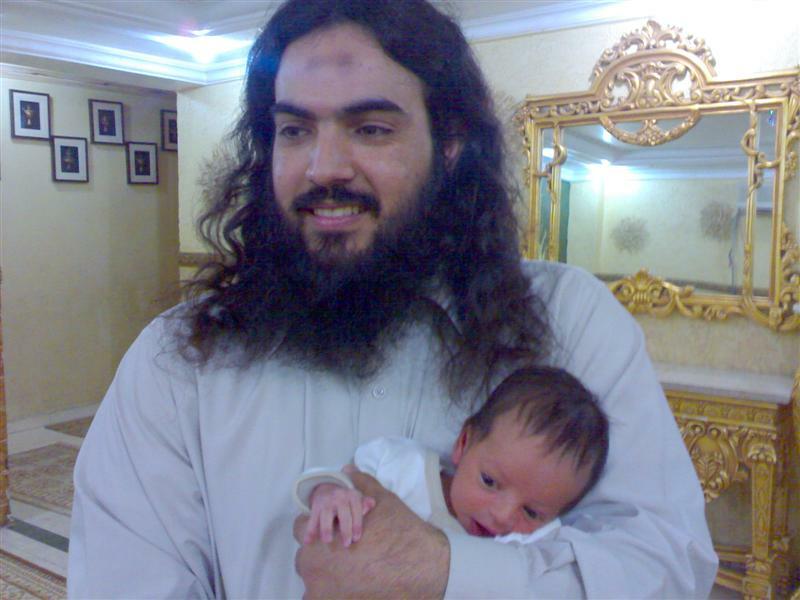 When we left Harbi, he had met a Algerian Jihadi who told him how to get to Iraq. 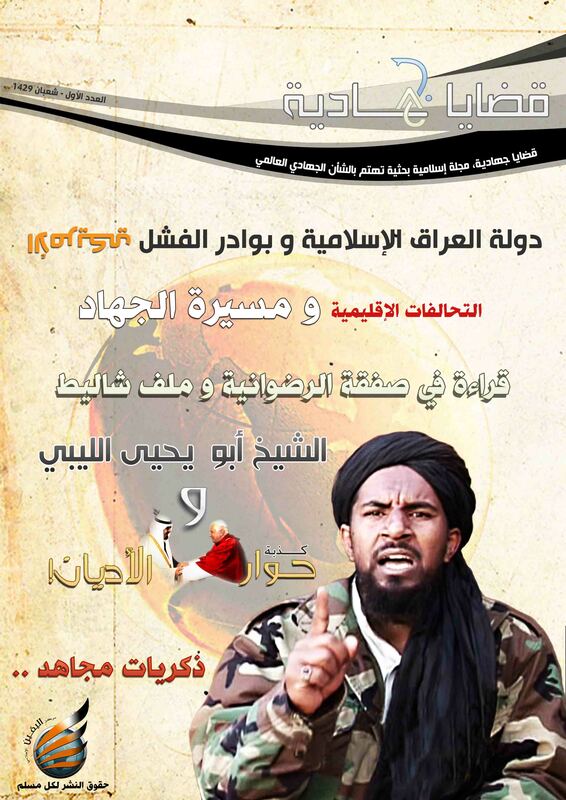 According to Furqan al-Junubi’s account, Harbi and two other Kuwaitis–Abu Salih (`Abd Allah Salih al-`Ajami), and Abu Talha (Nasir) al-Dawsari–pledged to go to Iraq and die there. They called this “The Pledge of the Houris” (the virgins promised to those allowed to enter Paradise–martyrs are a shoe in). Al-Miskin al-Muhajir was with them, but he could not go due to personal circumstances (he was able to go to Afghanistan latter–see part 1). I haven’t been able to find much on Dawsari, but there’s plenty on `Ajami. He was actually being held in Guantanamo until the U.S. transferred him to Kuwaiti custody in 2005; the Kuwaits acquitted him of all charges. By the time `Ajami met Harbi, he was married, had one child, and was financially comfortable. Those who knew him thought he had been rehabilitated. Before Harbi left, Junubi, the author of our account, wrote and wished him well. Harbi replied that they would soon meet in Paradise. Harbi’s response was dated April 5, 2008, which is probably after he had left Kuwait (one of his traveling companions, `Ajami, died in late March). Junubi relates that the three men wen to Iraq through a coordinator, but he doesn’t say where their transit point was. It has now come to light that the men went through Syria. 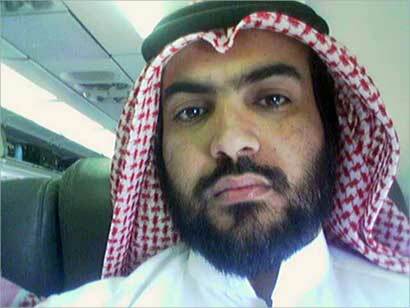 Indeed, one of the last photos of Harbi was taken by himself on the flight to Syria. 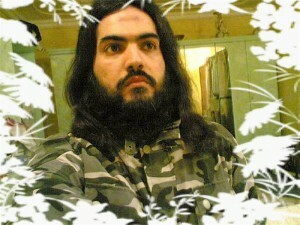 According to press reports, `Ajami called his family from Syria to tell them where he was headed and why. The next time they would hear news of him was when they received an anonymous call informing them that `Ajami had carried out a suicide bombing. Harbi’s family got the same call a few weeks later. According to a Furqan video that was posted on June 21, `Ajami carried out a March 23 suicide attack on the Harmat neighborhood of Mosul. A little over a month later, Harbi carried out an April 26 attack on the Tel al-Rumman police station in Mosul. (Bill Roggio at Long War Journal has a good summary of the contents, based partially on Nibras Kazimi’s analysis). The video is over 30 minutes long and tedious in parts, but many of the useful bits can be viewed here. Harbi is the bearded, long-haired man in the center of everything (his coiffure and beard seem to be deliberately modeled on that of Khattab, a Jihadi commander in Chechnya that Harbi emulated, according to Junubi). The first clip you see is that of Harbi talking about jihad and then chanting a nashid (hymn) with his brethren (notice the childrens’ voices in the background). The next clip is Harbi standing next to the vehicle he will use to blow himself up. After that is his attack on Tel al-Rumman, followed by `Ajami’s attack on the Harmat neighborhood. Last is Harbi again leading a group chanting a hymn. In the full video, Harbi gives his final testament (wasiyya), summarized here. In it, he criticizes a hardline Kuwaiti Salafi scholar, Hamid al-`Ali, for badmouthing the Islamic State of Iraq. He then explains to his family that he decided to leave for Iraq because the Companions of Muhammad did not choose to sit with their families when fighting was called for. (Harbi may have been feeling a little guilty–Junubi tells us that his mother was very ill when he left.) Harbi then chastizes other Jihadis for sitting behind their computers and doing nothing. I have everything: a house, a car, two wives, and eight children. But now I find happiness in my heart that I did not find in any other place. A mixture of indignation, glory seeking, camaraderie, and promise of eternal reward motivated Harbi and `Ajami to pledge themselves to die in Iraq. Since both had been detained and likely treated harshly, they may have been motivated by a desire for personal revenge as well. Syria is the transit point for our group, as it is for many other Gulfis seeking martyrdom in Iraq. 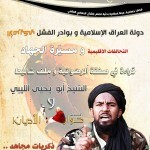 But note that it is an Algerian Jihadi, not a local Kuwaiti, that informs the Kuwaiti group of the route. After reading Junubi’s account, one Ekhlaas member asked 1) why Harbi went to Iraq rather than Afghanistan and 2) why he chose to be a martyrdom operative when he had enough experience to be a trainer. In other words, why didn’t a skilled Jihadi like Harbi put his talents to better use. Junubi answers that Harbi went to Iraq because it is much easier to travel there than to Afghanistan. Moreover, many go to Iraq because it is close by. On the second question, Junubi discloses that Harbi had thought about becoming a coordinator but decided he wanted to die a martyr and not fight (presumably since the latter did not guarantee martyrdom).